CID Auto Body & Paint specializes in Paintless Dent Removal (PDR) for cars and trucks. Call our shop in San Marcos for a quote today. Paintless Dent Removal is a process where small dents are removed from the body of an automobile by tools placed underneath the dent. The dent is gently pushed back to its original location without scratching the surface of the vehicle. Depending on how severe the damage is to your vehicle, paintless dent removal can be completed in the same day. 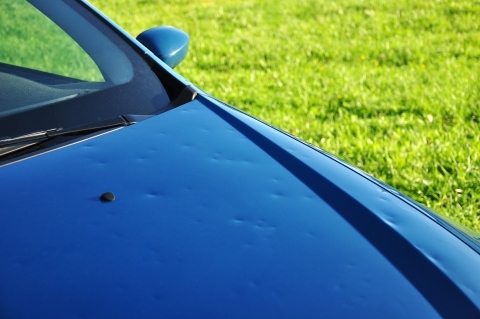 This process works on hail damage as well as body creases or other small dings. WHAT’S THE DIFFERENCE BETWEEN PAINTLESS DENT REMOVAL AND TRADITIONAL DENT REMOVAL? Traditional dent repair uses paint or a filler to fill in the dents in the vehicle’s body. This filler is then matched to the color of the exterior. While this process works and the vehicle looks new, the dent is still there. Traditional dent repair is also more time-consuming and expensive and may impact the value of your vehicle. Paintless Dent Repair requires no fillers and no sanding. PDR is cheaper and more effective than other forms of dent removal. It is environmentally friendly and takes less time to perform. PDR can be used on both aluminum and steel panels. Invented in 1960 by a Mercedes staffman who needed to remove dents on show cars before being exhibited, Paintless Dent Repair works extremely well with shallow dents (such as those from hail) and on metal that has not been stretched too much by the damage. CID Auto Body & Repair uses special rods in order to maneuver the dent back into place and special lighting in order to see the dent much more clearly. Paintless dent removal approaches the damage from the inside, removing panels and trim when needed. Our technicians are certified in PDR removal, which means they have expertise in reaching and removing your vehicle’s dents without damaging other parts of your vehicle.